A dramatically expanding bike share company that is set to place some 31 proposed bicycle-dock stations on the streets of the Mission District this year and next year will be steering clear of one: 24th Street. There, the neighborhood group representing the Calle 24 Cultural District – a stretch of 24th Street that is recognized by the city and state as a protected cultural District – was anything but thrilled with Ford GoBike’s (formerly Bay Area Bike Share) plans, which include adding some 3,500 bicycles under its program in San Francisco by the end of next year. “There’s a lot of cultural social and economic impacts that it would have on low income working class community. Part of our vision is to preserve this area for working class families. This doesn’t really fit into our vision and mission,” said Erick Arguello, who heads the Calle 24 Latino Cultural Corridor group. “I think it will be a clash on 24th Street,” he said and questioned whether the service that allows bicycles to be rented from the stations using a smartphone application will benefit the local community. Dani Simon, a spokesperson for Motivate, the bike-share company that runs Ford GoBike in partnership with the Metropolitan Transportation Commission, said the conversation with community groups including Calle 24 is ongoing. “We really want this to be seen as an asset to all communities around the city,” said Simon. But Arguello said that his group will not negotiate. “We told them no, and there will be opposition,” he said. Simon said that the company has done rigorous community outreach, including more than 30 town hall meetings with residents, to gauge approval and need in the city’s neighborhoods. Arguello said that the neighborhood council, representing businesses, residents, nonprofits and artists, was first approached by the bike share company some three months ago. “We appreciated that the company approached us… Most of the time things happen without even asking the community,” said Arguello. Regionally, the company hopes to expand to 7,000 bicycles in the Bay Area by next year, which can be rented from select stations via the app or through the Clipper Card system. A map showing the company’s proposed stops excludes the corridor stretching from Valencia Street to Potrero Avenue along 24th Street, with the closest stations proposed at 24th and Valencia streets and at 24th and Mission streets. Simon said that the stations will vary in size, with smaller stations holding 15 to 20 bicycles and larger stations holding as many as 30 to 50 bicycles. Arguello agreed, and said that is precisely why bike share should not set up in the cultural district. “24th street is a very narrow street – some of these stations are about three to four cars long,” he said. 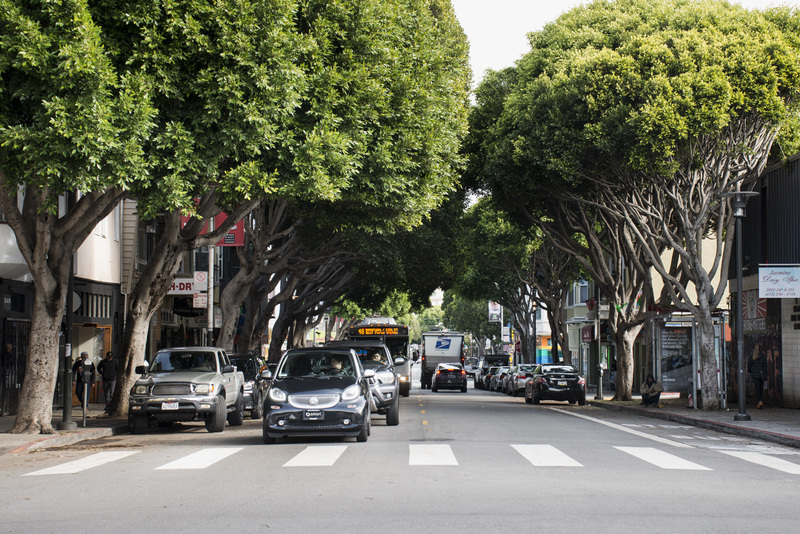 The group wants the plazas along 24th Street where the bike stations are proposed, such as the 24th and Mission Bart Plaza, for example, to remain accessible for community members to utilize as performance, event and social spaces. Arguello also questioned the need for the app-based bike share program along the transit corridor and whether its utilization by the local community. Hmmm. The Mission district has grown and changed just like a lot of the city and now you have a bunch of “community” people who are petrified of anything “gentrified”. Just relax people. The stations are eyesores, especially with the large Ford logo on each bike. Another winning position from the Calle 24 mafia: working class people don’t ride bikes. Low riders and over-sized SUV’s for all! sigh, clearly someone who doesn’t get it. Evidamente, este guey (y grupo) solo ve que “cambio” esta mal, no importa nada mas. could it be that the views of “own plans for its own community.” prefer Chevy over Ford? Opposing this is just terrible. “I think it will be a clash on 24th Street,” [Arguello] said and questioned whether the service that allows bicycles to be rented from the stations using a smartphone application will benefit the local community. While I am sure there are some people without smartphones it is worth noting that even most homeless people have smart phones. A 2011 study estimated that over 60 percent of homeless teen youths have a cell phone — and that number can only have gone up in the past four years. (source https://www.ncbi.nlm.nih.gov/pubmed/22076445) “At HandUp, we see people who are barely meeting their basic needs each month choose to fundraise to keep their cell phone on” (https://medium.com/conscious-by-handup/why-do-homeless-people-have-cell-phones-54549f661dd). Smartphones are no longer a luxury item but rather a basic necessity for all people. While I will accept that some people do not have any access to a smartphone that number is small, and in a working class neighborhood like the Mission, even smaller. Certainly more people have a smartphone than a car in the mission. Five dollars for unlimited bike rentals for a year! Think about what Arguello and Calle 24 is trying to keep from the working poor in my neighborhood. An effectively free mode of transit, for half the city! You have got to wonder why, why screw the poor from this free method of travel? Why is it good enough for the poor in the Tenderloin but not for the Mission? Because this has nothing to do with helping the working class or the poor, this has everything to do with merchants who erroneously believe only cars, the cars they drive, the cars most working poor cannot afford, are the sole source of customers, a fact proven wrong over and over in every survey done about how people in SF do their shopping. So even four parking spots off of 24th street is even too much for the members of Calle 24 to lose! Arguello agreed, and said that is precisely why bike share should not set up in the cultural district. “24th street is a very narrow street – some of these stations are about three to four cars long,” he said. Yeah, some three to four cars long, but most are not.The Mission could easily accommodate four spots, spots that belong to all of us, not just the Calle 24 merchants association, not just car owners, every one of us owns the streets, and I think that should include those too poor to afford a car. Arguello should know people in his community, including people like myself who live in the Calle 24 Cultural District, will also oppose his, and his groups anti-poor stance on this issue. I’ve written my supervisor, I’ve written Ford Bikes, and I’ve written my local newspapers. Opposing these bikes are bad for the poorest segment of our society and benefit the richest, the shop owners and business owners. Well said – thank you!!!! At some point Erick Arguello needs to be checked. He says we oppose the red bus lanes that help Muni because red is a gang color. Never mind that we ride Muni, our kids do and so do our elderly parents. Now he wants bike sharing to go away when it gives us easy access to the Mission without needing a car. What does Erick think we want? Or care about? What we do care about is access and a community without pollution and asthma. How is bike sharing and better Muni a problem? This is laughable. Mr Arguello, you do not speak for the community and you risk leaving behind a harmful legacy in the Calle that will far outlast your brief notoriety. You should seriously consider building a wall around your special district, especially to keep the “newcomers” from appreciating or appropriating your Mayan temples. Please explain how sustainable bike transit for low income peoples is less important than one or two SUVs being able to park right on 24th? If you can afford a car or SUV in the city you can afford essentially free city bikes.